The Princess of France (Helen Caspedes), with Boyet (Biko Eisen-Martin) and ladies Rosaline (Marinda Anderson), Maria (Charlotte Graham) and Katharine (Laura Gragtmans) arrive in Navarre. Photo by Ellie Haugsby. You can assess the mettle of an acting company not simply by what members deliver after weeks of study and rehearsals but by how they react to unexpected mishaps. During the play-within-a-play near the end of Thursday’s opening-night performance of Ethan McSweeny’s astute and playful production of “Love’s Labour’s Lost” for Chautauqua Theater Company, an actor inadvertently knocked over a statue of Cupid. The prop shattered, leading to laughter that threatened to take the play away from its purpose. But actor Dave Quay, who plays the young king’s friend Berowne and who had had some very funny stage business with said prop earlier, quickly brought things under control. He picked up the main remnant of Cupid and put it under some foliage, literally putting a lid on the moment. In leading the recovery of the play, Quay showed an impressive presence of mind and turned what could have been an unsettling irritant into one of the production’s pearls (and something that should somehow be incorporated into the staging). The incident also highlighted the general strength of an acting ensemble that admirably tackles one of the Bard’s earlier works. While I love the dense wordplay in “Love’s Labour’s,” it is not one of my Shakespearean favorites. I find some of its humor a bit arcane (especially the jokes in Latin), and it wears its erudition on its sleeves like a youngster trying to impress. Besides, the play’s themes, including the conflict between the high ideals of learning and the stirrings of lust — between youthful desire and sobering reality — get better expression in Shakespeare’s later plays that also focus on matters of the heart, deploy plays-within-plays and use clever puns. Director McSweeny has taken some liberties with his gloss, re-imagining characters and setting “Love’s Labour’s” at a Chautauqua-like place in 1913. The world may be on the verge of a global conflagration, but the young people seem to have not a care. They frolic and find sport everywhere (football, lawn bowling, painting and archery all figure in the production). 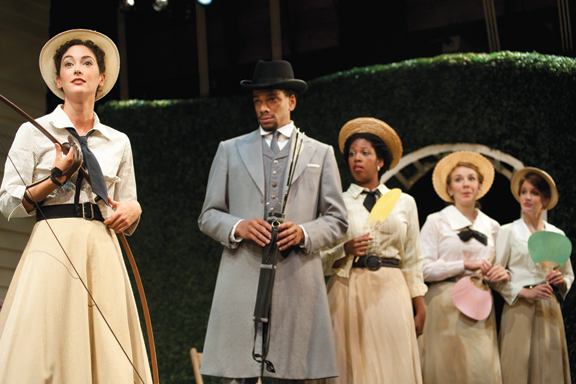 The production’s design (the replica of the Athenaeum Hotel’s colonnade façade is by Lee Savage; Tyler Micoleau’s summery lighting and Tracy Christensen’s Ivy League summer camp costumes) suggests a milieu where young men on the verge of explosive knowledge are fearful of what they do not know. King Ferdinand of Navarre (Josiah Bania) and his virile friends Berowne, Longaville (Tyee Tilghman) and Dumaine (Peter Mark Kendall) swear off women for three years. They want to plunge into their studies. But their vows are tested by the arrival of the Princess of France (Helen Cespedes) and her traveling companions Rosaline (Marinda Anderson), Katharine (Laura Gragtmans) and Maria (Charlotte Graham). The French court is chaperoned by the sexually disinterested Boyet (cool cat Biko Eisen-Martin). There is a subplot involving Spanish nobleman Don Adriano de Armado (the heavily accented and extravagantly entertaining Benjamin Mehl) and country wench Jaquenetta (Andrea Syglowski). It is easy to get swept up into McSweeny’s production, which is suffused with Steven Cahill’s ragtime-inflected score and live music. The director does not substitute physical comedy for the dense language, as other directors have done. And the acting company delivers the language with fluid lyricism, eschewing the preening declamation that one sometimes finds with young performers of Shakespeare. In fact, they are a pleasure to watch and listen to. Quay’s Berowne is an obvious standout, as the actor commanded the stage with charisma and natural ease. But he was not alone. Bania invested Ferdinand with scholarly precociousness. Tilghman’s Longaville suggested a Ralph Lauren model as Rhodes Scholar and Kendall delivered a controlled but witty Dumaine. The king’s court was matched with similarly commanding performers on the princess’ side, with Cespedes giving a powerful but playful princess and Anderson investing Rosaline with verve. Young people dominate “Love’s Labour’s,” but there are veterans in the cast as well, including Jarlath Conroy as the lusty schoolmaster recast as a Methodist minister Holofernes; Carol Halstead as Lady Nathania the righteous, probably abstemious Salvation Army officer; and Chris Corporandy as glum news-bearer Marcade. The three of them add energy to a production that vividly shows that love for young people is less something that you fall into than a sport to be played. Rohan Preston is theater critic at the Star Tribune in Minneapolis.